Under current law regulations in Germany, if you’re an international student coming from a non-EU or non-EEA country, then you must prove you have the financial resources (Finanzierungsnachweis) to cover your living expenses in Germany. Proof of financial resources is an important condition to get your student visa and your study residence permit. Read this article for detailed information about opening a blocked bank account in Germany. A blocked account is a special type of bank account for international students in Germany, to prove they have enough financial resources to live in Germany for one year during their student visa application. You can open a Germany blocked account at Deutsche Bank or Fintiba. 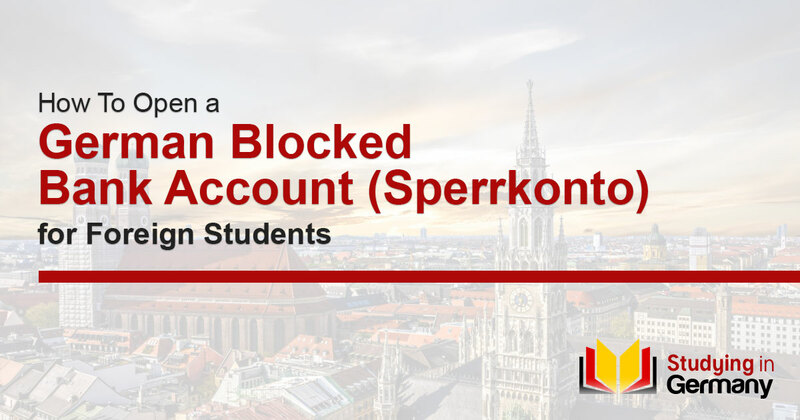 Also known as a Sperrkonto, the German blocked back account is designed to serve foreign students and job-seekers as a proof of financial resources for staying in Germany. Even though there are other ways of showing one’s financial standing, this account is by far the most common one among international students. By allocating a certain amount of money that is determined by the German government, to the blocked account, a person willing to reside in Germany for a period of time testifies that he or she is able to handle living and other expenses during that time. 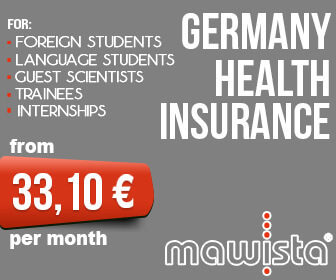 In 2018 it is estimated that a foreign student in Germany usually spends around €720 euros per month at a minimum. If you multiply this number by 12 months you get €8,640. In other words, this is how much you’ll need at the minimum to live in Germany for a year. Therefore, this value sets the minimum amount of money required to be deposited in the blocked account, so you can prove your financial means (Finanzierungsnachweis) to get a student visa. Haven’t Opened Your Germany Blocked Account Yet? Most International Students in Germany Prefer Fintiba. It is also important to know that the required monthly minimum serves as a maximum amount that can be withdrawn or transferred by the account holders within a defined period of time, unless someone has paid more than the demanded minimum blocked amount. How to Open a Blocked Bank Account in Germany? Choose the provider (Fintiba or Deutsche Bank). Apply online for your blocked account (only applies to Fintiba). Download and fill the pdf application form (only applies to Deutsche Bank). Seek proper legalization at the German embassy (only if you’ve chosen Deutsche Bank). What documents are required for opening a German blocked account? The list of required documents to open a blocked account may vary depending on your nationality and the bank account provider you choose. With Fintiba, for example, you would only need an ID card or passport to register and create your account. Below, in this article you will find more detailed information on opening a blocked account at both providers. But, first let’s see which provider has more advantages. Fintiba or Deutsche Bank? Which one to choose? Below we have provided a comparison between Fintiba and Deutsche Bank. The table aims to assess which are the most common problems international students have at each of them regarding the opening of their Sperrkonto. Which blocked account option do international students choose the most? Both options have their own advantages and disadvantages. But, in general, the majority of international students choose Fintiba over other options mainly because applying through Fintiba is way easier and less time-consuming, and it can be done online. Many students that experienced other options available for opening a blocked account highlighted delays and unreasonable rejections as the top problems they faced. Because of this, many students lost their appointment and were late in submitting their student visa applications. In some cases, students were subject to visa rejection without receiving an objective reason. On the other hand, international students value Fintiba for their flexibility. The whole application process is easy, online, there’s no need to go through legalizations at the German embassy, and the opening of your blocked account takes only a few days in the web or mobile application. Fintiba is a full-service provider that supports students on their journey to Germany in many different aspects. In the app you will also find digital solutions for a health insurance, liability insurance, rent deposit insurance and much more. Fintiba Plus, for instance, is a combined package that offers both a blocked account and a customised health insurance. Everything will be personalised to your specific situation and the package will include an incoming insurance required for your visa along with a governmental insurance required for your university enrolment. 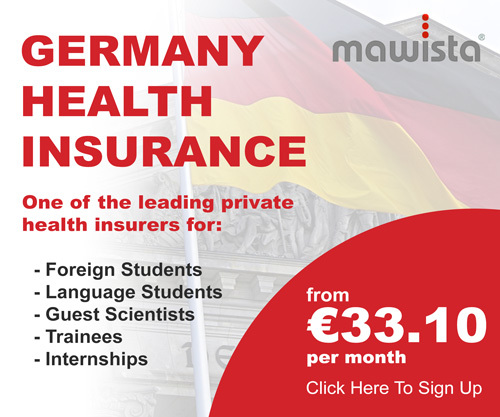 This offer is specifically attractive because students don’t need to visit any local insurance office since everything can be completed online. Should you decide to go for Fintiba Plus, a cashback of 110 euros can be activated for all students activating their statutory insurance. Since you will deposit a large amount of money into an account that will be blocked for a certain duration, it is highly important that you open the bank account under your own name and that no third party is involved in this process. At Fintiba you will get access to your personal account that you can access via a web or mobile application. There you can manage everything online and very easily by yourself. All relevant information (like account balance and issuance of blocking confirmation) is always available in the app and you will always be notified if actions are required from your side. How to open a blocked account at Fintiba? As a foreigner, it’s normally harder for you to cope with the challenge of carrying a process of opening a blocked account all alone and manage other issues that show up on the way. Lucky for you there are organizations that serve as an intermediary party between you and the bank. Their role is to ease the whole process by leading your way through and carrying almost everything on their own. One of these intermediary parties, we highly suggest you use is Fintiba. Fintiba helps international students and other groups of foreigners that land in Germany for different purposes One of the many services they offer is opening a German blocked account (Sperrkonto) which is officially approved by the German Federal Foreign Service. First, you have to register on their website or in the Fintiba-App. Fill the application form with your personal identification data. Make sure you have filled the application form properly or it won’t be recognized. Then you’ll gain access to their online platform where you can easily manage all personal details related to your blocked bank account. Once you receive the account details, deposit the money in your account and pay the initial fee that the bank charges you. As soon as the money is transferred, you’ll receive an email to confirm the opening of your blocked account German: “Sperrkonto”) and the amount of money you have deposited. 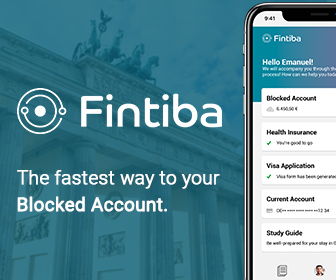 Finally, after arriving to Germany, Fintiba will help you open a normal bank account where they transfer money from your blocked account each month. Depending on your passport and nationality you might have to complete an additional step which is the final legitimation in Germany. The best part is that everything can be done online and you don’t need to send any original documents by mail. Haven’t Opened a Germany Blocked Account Yet? Most International Students in Germany Prefer Fintiba. How to open a blocked account at Deutsche Bank? Until a few years ago the Deutsche Bank has been the only option for international students to open a blocked account in Germany. Fill the application form with your personal information. Print out two copies of the completed application form. Arrange an appointment at the German embassy and make sure you have the necessary documents. The embassy will complete legalization formalities and will send them to the bank in Germany. The bank will then leave you an email to confirm your Sperrkonto is ready and will attach the details of it. Deposit your money and pay the bank’s initial fee. Finally, the bank will confirm the balance of your account. Once the Deutsche Bank receives your application they will inform you when your blocked account is ready to make a deposit. As soon as you receive the confirmation email, transfer the money into your Sperrkonto and continue with your student visa application process. When is the best time to open your blocked account in Germany? Quite often international students complain that the confirmation of their blocked account being opened takes more time than it normally should. Other than the bureaucratic procedures that often make this process longer, the reason behind this delay can also be the timing of your application. There are times when banks receive a high number of applications from international students or are overloaded with their regular work. This may lead to a delay in the opening of your Sperrkonto. The good thing is German universities obtain a large number of applications and cannot go through them at the same time. You can gain an advantage and be well ahead in time than other successful applicants that will be receiving their admission letter later on. As such, we highly recommend you start the procedures as soon as you get your admission letter. Until that time you should have made up your mind which path you will take to open your blocked account so you won’t lose time deciding. How long does it take to open a blocked account in Germany? The time it takes to open a blocked account in Germany depends on factors like your nationality, the provider, the workflow of the German embassy in your home country, your paperwork, etc. If everything goes well, your blocked account should be ready within a week from the day you submit your application. For example, opening an account at Fintiba usually only takes a day from the day you fill out the application form. Naturally, missing documents may cause long delays and may even lead to an ultimate decline. How to withdraw money from your blocked account? Once you settle at a registered address, you can withdraw money from your blocked amount. Keep in mind, however, that you won’t have direct access to your blocked amount in Germany. With that said, the only way you can withdraw your money is by opening an international student bank account in Germany where your blocked money will be transferred every month. Currently, you’re allowed to withdraw a maximum of €720 per month (sometimes up to €735) unless you’ve deposited more money than the required minimum. This amount of money is transferred from your Sperrkonto to your regular account (or international student bank account) from where you can freely withdraw your money. Can I deposit more than €8,640 in my blocked account? Yes, you can. This is only the minimum amount of money required from you to apply for your student visa. The German government wants to you that you have the necessary funds to live in Germany for at least one year. What if my German student visa application is rejected? If your visa application is rejected by the German embassy in your home country you will be refunded. Contact personally the blocked account provider or the German consulate in your country and they will tell you what you need to submit in order to get your money back. Note, however, that transfer fees will not be refunded. Do I need to prove the source of the money when opening my blocked account? With Fintiba, there is no need to prove the source of the funds that you transfer. With Deutsche Bank, on the other hand, you will have to show the origin of your funds. There are different ways you can do this. The most common way of proving your financial means is by submitting a bank statement that reveals your deposit records in a bank. Is there any administrative fee to open an account? Yes, the blocked bank account provider charges you an initial fee for its service. Do I have to pay a fee for maintaining my blocked account? After you pay the bank for their services a low monthly fee may follow. Can a third-party send the deposit on my behalf? Yes, a third-party can deposit the funds on your behalf. However, they must prove their identity initially. The blocked account provider may request an authorization from you to that person or organization, a valid passport and a bank receipt of the bank transfer. Is the money safe at my blocked account? Yes, they are. The Association of Banks in Germany are participants of the Deposit Protection national scheme under which every German bank guarantees to protect deposits with up to 20% of their total capital. Are there exemptions to opening a blocked account? A blocked account is only one way of proving that your financial standing is as required. With that said, there may be other forms you prove it, but you need to ask at the German consulate beforehand. For example, you may have a relative residing in Germany who guarantees he will cover the cost of your stay in Germany. Can I speed up the procedure of opening a blocked account? Unfortunately, you can’t. Even if you’re short on time, the bank cannot proceed faster with your application. Where do I register my address for my blocked account? You can register your residence in Germany at the local Resident’ Office Registration or Einwohnermeldeamt as it is known in the German language. Within two weeks of your arrival in Germany, you have to register your address. The bank will need it so they can send details of your blocked account once you arrive in Germany.